As surely as the Great Bird wings onward to its unknown destination, so change comes upon the world. And change is embodied in the Aji. The Aji (plural) are revolutionary teachers and leaders who implement great religious and social change. An Aja transcends individual traditions, often combining aspects of them in new and surprising ways. Aji are associated with technological progress, religious innovation and social upheaval. They are forces of change, but often leave great destruction in their wake. Tlön tradition recognises seven mythical Animal Aji, seven semi-legendary Aji of the Sky and six historical Aji of Progress. The coming of the seventh, final Aja is anticipated with both deep longing and deep fear. Through the teachings of the Aji, a profound respect for all life and an abhorrence of murder and violence have permeated society. Through the actions of the Aji, systematic violence and warfare—so it is hoped—have been banished forever. Yet human passions always find expression, and enmity and hatred take new forms. For every Aja there is a Hero, a dark champion and defender of the old ways who will oppose the new with violence, terror and deception. In Ontolosna, the deities, or Kut, are real. The Kut—the term means both ‘god’, ‘demon’, and ‘ritual’—though powerful, are part of the world ecology of Gi (‘power’) and Ki-ok (‘memory’), and are creatures created within time by natural forces. Limited and often flawed, evolving as the world evolves, some Kut remain wild and tempestuous, while others have taken on the sensibilities of the human Theagyns (‘goddess birthers’) who have tamed and shaped them. The exact role of bound or awakened Kut vary, but in the main they protect communities and focus the power of their human partners to prescribed ends. Kut can be powerful guides, or servants, or sometimes masters. Often they are uneasy partners that might need to be bribed, compelled, bound or punished. Some of the Kut are first in might and wisdom and beauty, keepers of all that is good, while others are duplicitous and demonic. Dealing directly with any Kut is often like dealing with an autistic child—a wilful, sullen child of enormous power. In the Perfection of Tlön, Kut enjoy limited rites in law and property. And the Kut often hate their priesthoods, who direct and seek to control them. Often, a Kut will work through an independent agent to subvert the plans of her own priestesses. Among the most important of the Kut are bi Ka’tamalah the Great Mother, Shining Sun, Sky-Woman of the Pearl Carousal; the fearsome and terrible Komun Black Tongue, the book burner, remover of obstacles and mistress of the fierce da kini warrior nuns; Byo Shu the Mushroom Horse Rider, Revealer of the Real and Mistress of Sacrifice; bi Bo Ki Sha, the beautiful strong-voiced daughter, trader and pilgrim, Goddess who walked as a Woman; Tkk Tkk Tkk the Hidden One; Yo Ki of the White Mountain Ridge, husband and companion, guide of lovers and ascetics; Bong Bong the Mind Ape; Krash the Pilgrim; Shijun the Copper Bow; The Kitchen Bird; and the San Sin (sullen but powerful mountain Kut). A range of religious technologies known as The Four Giftings have been developed to allow humans and some animals to interact with Kut, or with ancestors and descendants, or to seek the paths of liberation. 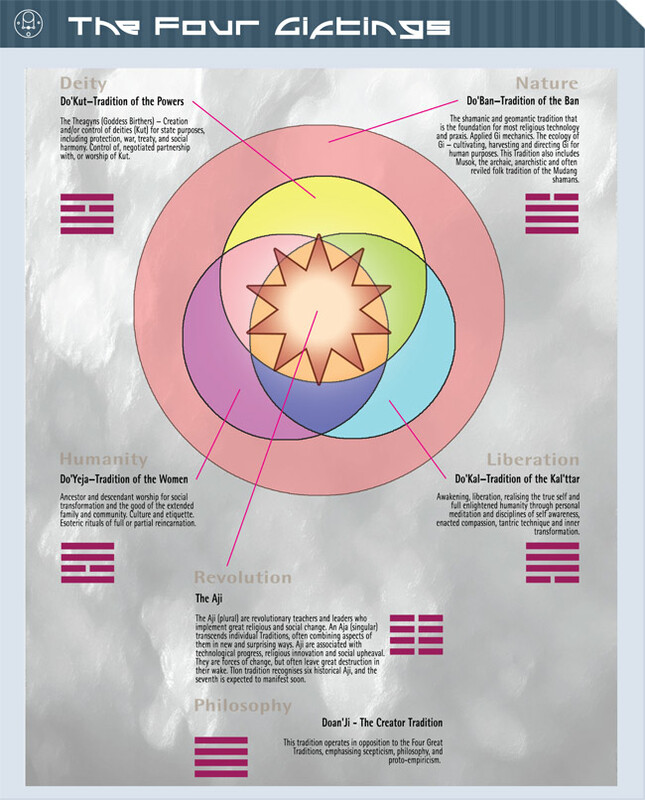 The Four Giftings—there are actually six main traditions, which respectively concern Kut, nature shamanism, ancestors and descendants, liberation, social revolution, and philosophical scepticism—each have their own methods and goals, their own strengths and secrets, their own rites and magics or powers. And all have a profound this-worldly orientation, with little speculation concerning survival or reincarnation beyond death.